I love cooking easy recipes for my family. To save my sanity, time and money, I do weekly meal planning to get dinner on the table for our family. Let’s face it, our kids do not want a gourmet meal, they just want time together around the table. 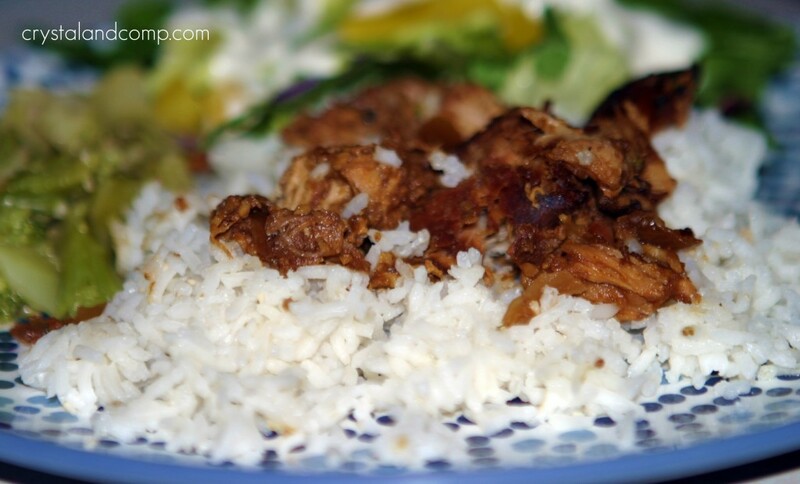 This crockpot recipe is a for sure crowd pleaser. I love recipes using apple butter so this seemed like the perfect dinner for my family. This recipe defines the smell of fall comfort food. My house smelled amazing while this was cooking in the crockpot last week. Recently we went on a field trip with our twins’ Mothers Day Out group. The trip took us to a local apple orchard here in the metroplex. We picked apples, learned about honey and bees and purchased some apple butter. Other than eating it on warm biscuits, I had no idea how I was going to utilize this delicious jar of goodness. So I reached out to my Facebook readers for some ideas and they shared plenty. And that my friend, is where the idea for this recipe came from. And of course, I wanted to crockpot-it! It just makes life easier, ya know. 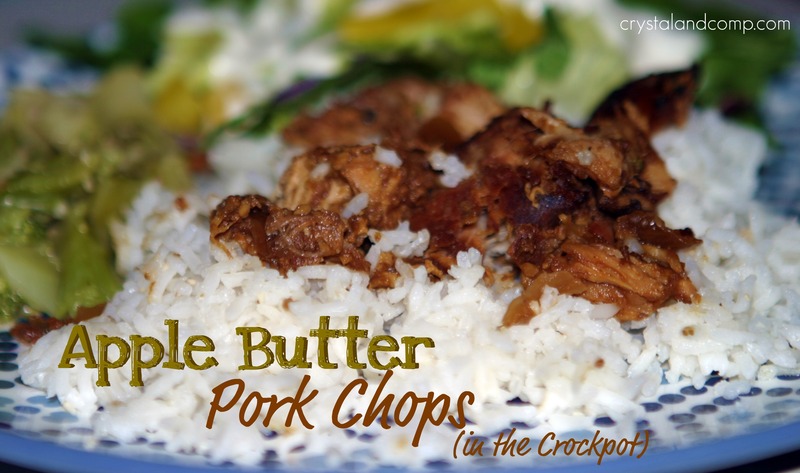 Arrange your pork chops in the crockpot. 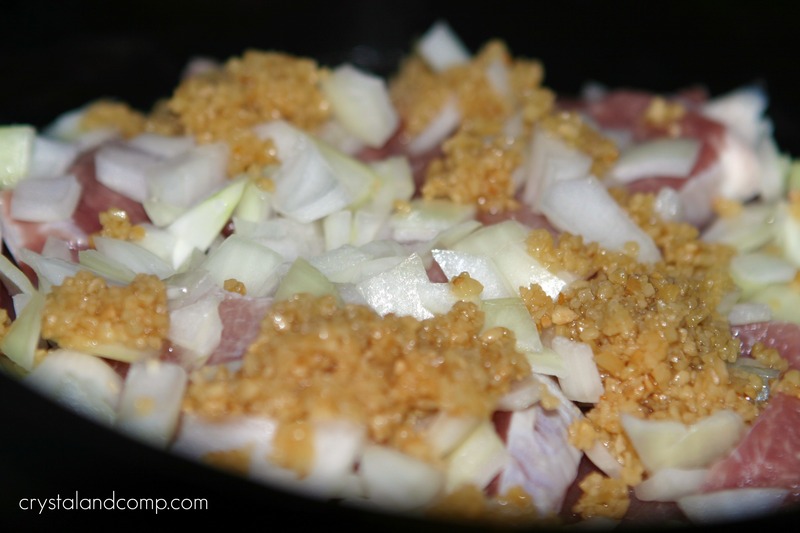 Top the pork chops with the onions and garlic. Spoon the apple butter on top of the onions. 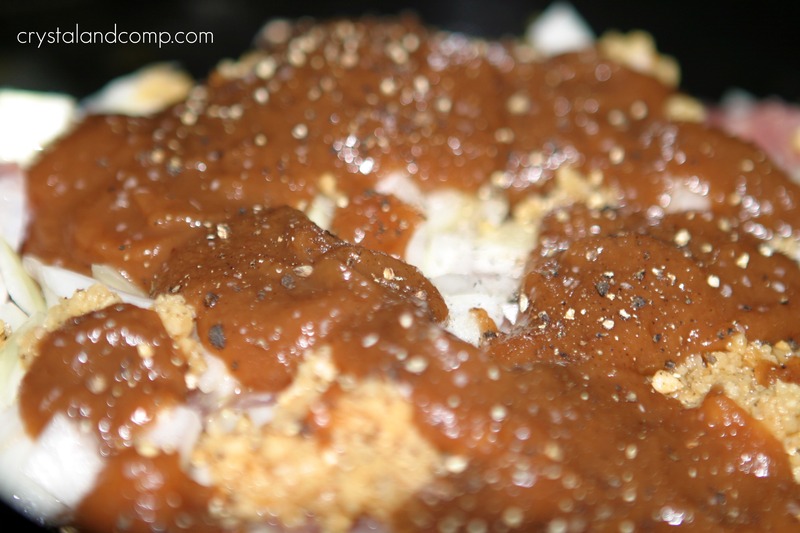 Crack some pepper over top and put the crockpot lid on. Let it cook for 4-6 hours on high or 8-10 hours on low. When it is done, give the pork chops a stir and they will literally fall apart into chunks on their own. I served them over steamed rice with a dinner salad and steamed broccoli. Crack some pepper over top. Put the crockpot lid on. I served this over steamed rice with a dinner salad and steamed broccoli on the side. This sounds really good (and easy to make!). We’ve made up a lot of pumpkin butter this fall and this would be a perfect recipe to use some of it in!! It was easy and very yummy! Pumpkin Butter? I bet that would taste amazing. Let me know how it turns out if you try it over the pork chops. Crystal recently posted..Does Your Car Beep? This will be a great recipe to have in the Crock Pot for the Cowboys game tomorrow night. It really looks delicious! Thank you so much for sharing with Full Plate Thursday. Hope you are having a great week end and come back soon! I have a nice supply of homemade apple butter. I will definitely have to try this recipe. I looks very good. Thanks for sharing. I dont have apple butter but have apples will try this recipe using lamb will let you know how it comes out. Maggie recently posted..Gluten Free Apple and Yam Casserole Recipe! We loved these pork chops! Simple, relatively healthy, and a good choice for both my kids and my husband. We’re having them again tonight, and I was reminded that I hadn’t posted a review yet. 🙂 We added a bit of salt along with the pepper. Just a pinch. Awesome, Aileen. so good to hear that they are a hit at your house! Hi Crystal. I made this recipe a few weeks ago. I cooked it on low for about 8 hours in a 6 qt crockpot. It completely burned, yes, burned in the crockpot! Did you use a smaller crockpot than the 6 qt I used? I’m trying to figure out why this happened. I don’t know if I didn’t have enough in the crockpot and that’s why it burned or if my crockpot has issues. It’s only a few months old and it seems to burn or dry out everything I cook in it. Any advice? I used a 6 qt, but my porkchops were thick butterfly porkchops, so they took up a lot of room. You want to fill your crockpot 1/2 to 2/3 of the way full for best cooking results and/or cut the cook time down. What kind of chops did you use and how full was your crockpot? Okay….I have this in the crockpot for tonight! So excited!!! Yay! I think you’ll really enjoy it. I am eager to hear how your family likes it. Can this be baked in te oven instead of using the crockpot? Absolutely. Anything that can be cooked in the crockpot can generally be cooked in the oven by adjusting the liquid levels. While I have not prepared this in the oven, if I were I would add a cup chicken broth to prevent drying out. 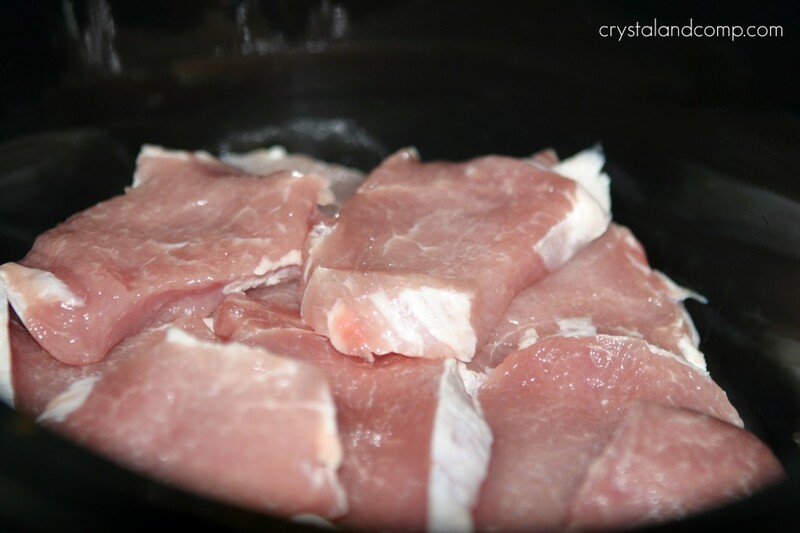 Can you use frozen pork chops for this recipe or do they need to be thawed? Yes, it will just take longer to cook. I made this using cheap store brand apple butter, added 1 cup chicken broth. OMG good 1 As my daughter said . the flavors just ‘call you back’ Thank you , thank you. I would love to try this! I haven’t been able to find any apple butter in my Kroger nor Walmart. What is a recipe that I can use?